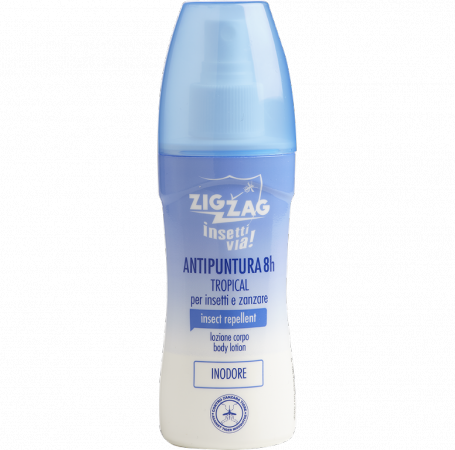 The vaporizer ZIG ZAG INSETTIVIA TROPICAL LOTION NO GAS INODORE is a repellent insect that defends you from the Common Mosquitoes (Culex Pipiens) and Tigre (Aedes Albopictus) for 7-8 hours and from the Ticks (Ixodes Ricinus) for over 5 hours. Provides optimal long-lasting protection even in critical conditions, such as wetland marsh areas, during hunting, fishing, camping etc. This product is also available in "talco di Marsiglia", "geranium and Java citronella" and "bitter lime".